Ever wanted to go on a tour of the world that the Marvel superheroes fly around in? Thanks to Flickr member ChildOfAtom, that's easier than ever. He's gone to four of the real world addresses of some of the most famous addresses of the Marvel Universe and taken photos of what's actually there, and posted those photos online along with comparisons to their cartoon counterparts. 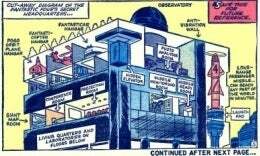 Want to see what we have instead of the Baxter Building or Daily Bugle offices? Click under the jump.